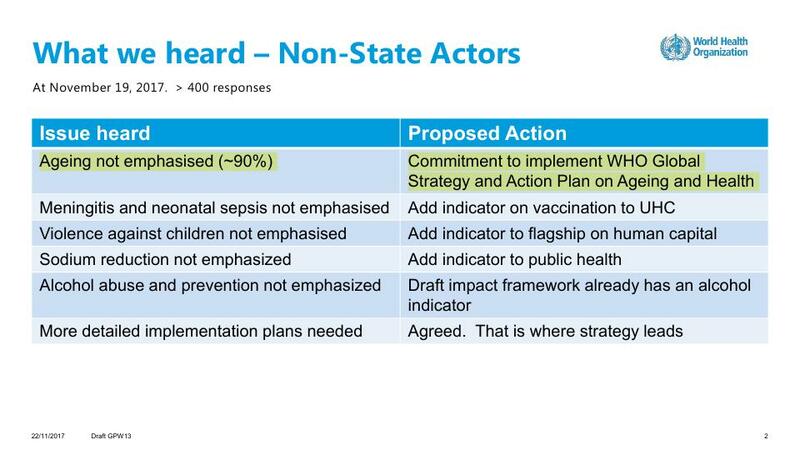 It looks like our joint advocacy efforts so far with the WHO had some effects. About 90% of the responses (of over 400 by Nov. 19 and more are coming in) were about the lack of aging in the WHO program. 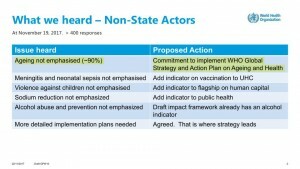 And following those comments, as the “proposed action” WHO apparently plans to commit to including WHO’s earlier “Global Strategy and Action Plan on Aging and Health – GSAP” in its work program (including GSAP strategic objective 5 “Improving measurement, monitoring and research on Healthy Ageing”). But apparently some contribution was made. Thank you very much for your involvement and effort! That is just a start. We can still advocate with WHO for the strong emphasis on aging health and R&D for healthy longevity through May 2018 (when the work program is submitted to the WHO assembly). Please also spread the word (also in the media and social media, as mass media ignores this topic, even though this issue relates basically to everybody). We have to make the need to promote aging health overwhelmingly clear to WHO (>95%)! Further update (as of December 7, 2017). Concretely, it looks like the WHO intends to amend the draft Work Program to include the clause “Reduce the number 65+ who are care dependent by 15 million”. That is just a preliminary notion. Yet even this notion appears to be encouraging. Of course, this is not a strong impact objective, considering there are hundreds of millions of elderly whose care dependence needs to be improved, also thanks to developing better therapies and technologies through biomedical research of aging. But it may be a good start for introducing the objective of improving aging health, also for national advocacy efforts — considering that originally the issue was not in the WHO work program at all, and was introduced thanks to the international advocacy campaign! Indeed, thanks to the international advocacy campaign, WHO has included a focus on “healthy aging” into the new WHO draft work program (the advance version was published on line on January 5, in the link below). See especially paragraphs 15, 16, 17, 37, including the WHO commitment to advance the Global Strategy and Action Plan (GSAP) on Ageing and Health (until 2020, including the strategic objective 5 for “improving measurement, monitoring and understanding of healthy ageing”) and to prepare for the Decade of Healthy Aging (2020-2030). Perhaps the most significant for advocacy is that Paragraph 15 of the work program declares the major public health goal “to live not just long but also healthy lives” and suggests the use of “healthy life expectancy” as the main measure of health care success. Such goals and measures for healthy longevity can be advocated and quoted also at the national and local level. So thanks again to everybody who participated in the campaign to include aging health into the WHO work program for your contribution! Here the head of the WHO Ageing and Life Course division acknowledges the importance of this campaign for the change of the program, and quotes the article “Aging health and R&D for healthy longevity must be included into the WHO work program” as an example of the joint advocacy effort.